Better than in the city. 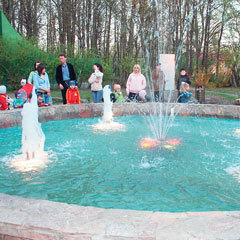 In Borinskaya, on the banks of the local pond, build a recreation area for the villagers. Local government for the resettlement of the coast did not spend a dime. All costs assumed by sponsors. More recently, the pond on the outskirts of the village Borinskaya except ducks geese so few people are attracted. Now, even on a weekday is willing to sit by the water. Comfortable gazebo, beautiful design. You can come with the company. Roast barbecue, chat in the shade. Alexander Berezin, resident. Borinskaya: "Nature, gazebos, thanks to the one who invented it. After working with the family can come "
Yevgeny Fyodorov, resident. Borinskaya: "Here it is good to rest — beauty, nature. What more do you need? " The idea to arrange a rustic recreational area of the local authority suggested by the residents themselves. Themselves and went to work. The administration did not spend a dime. All expenses were covered by sponsors — also borintsy. Here is the stone — on their own initiative — brought one local resident. The other — also at the personal initiative — the engraved inscription.Marina Karasik, a reporter: "Right from the yellow brick road, as in the children’s fairy tale about Dorothy and the Wizard of Oz. Here the road ends. Next — weeds and grass. But it just yet. The plans — to extend the track along the pond, there is a beautiful meadow, put a few houses there and organize recreational area. " I wish to swim in the pond while it is impossible. To do this, the bottom should examine divers, and set watch on the beach lifeguards. Promise to resolve the issue later. Lipetsk region, Lebedian. Four and a half million rubles allocated for the administration of the revival of the city park area, have transformed the place of rest. The three existing purchased five more modern attractions, repaired fences, sidewalks, benches, garden furniture, urns, planted shrubbery. Now the works on children’s cafe equipment, rehabilitation Circuit, wrapping up plumbing. Now here regularly playgrounds, theme evenings for adults.